Whip up a batch of these whole wheat biscotti with dark chocolate and cherries for your next holiday coffee break. They are more than happy to be dunked! 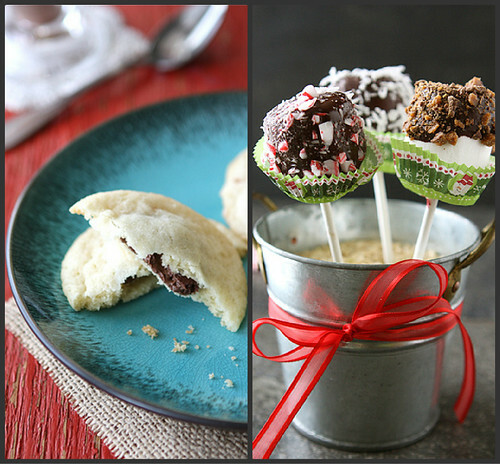 The holidays are here, and that means cookies galore and activities that involve dressing like the Pillsbury Doughboy. We did both this past weekend. The cookies involved a whole wheat version of biscotti, studded with dark chocolate and cherries. I know, I know…that’s why you’re really here, isn’t it? 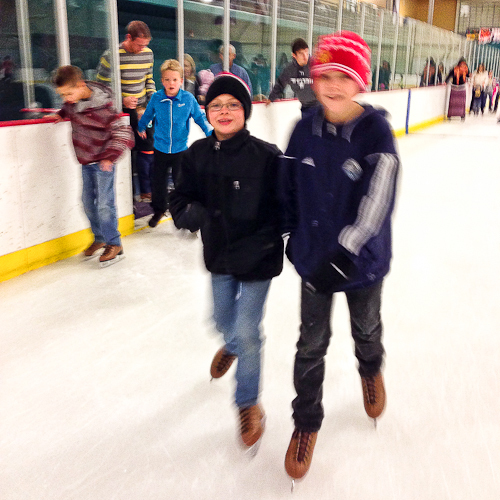 For the winter activity, we all brought out our inner Wayne Gretzkys and donned some ice skates. I documented the comical event (let’s just say that the boys’ jeans were soaking wet by the time we finished) on my Instagram and Facebook accounts for all to see. 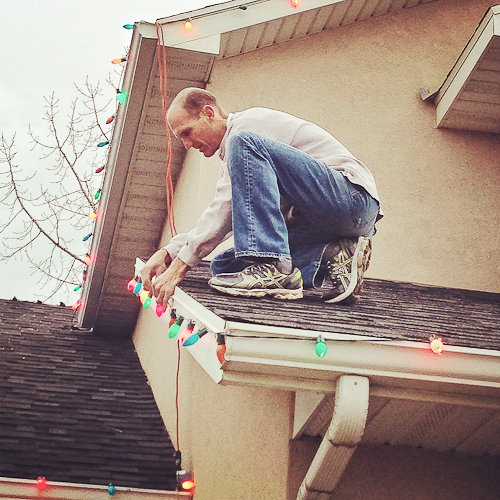 And while I was inside whipping up a big batch of biscotti, my husband took advantage of one of our last “warm” days to put up the Christmas lights. , which provides a finer texture and takes away some of the fiber-full taste. 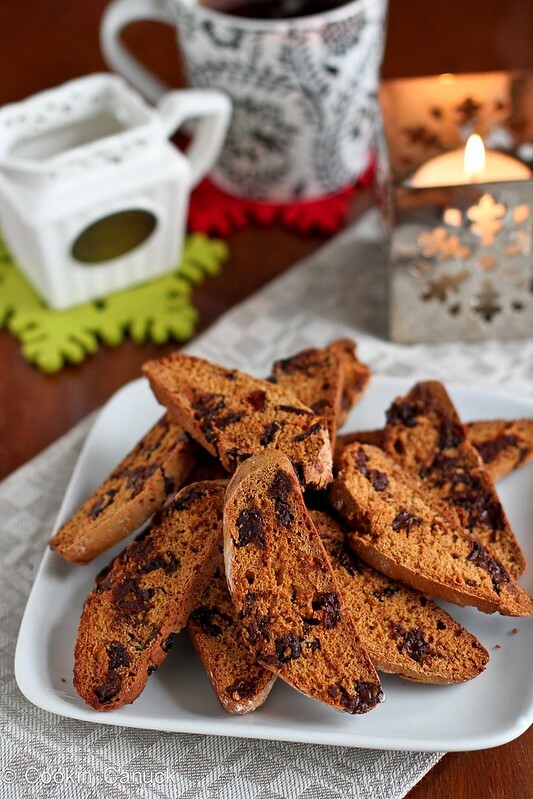 One of the trademarks of biscotti is that they are baked twice. The first round happens when the dough is formed into logs. Once the dough cools, it is cut on the diagonal, then baked again to form the crisp, distinctive texture. Are these exactly like regular biscotti? Nope. But they are darn good, and they soften and dissolve slightly when dipped into a cafe latte just like the original version. And, oh yeah, each one has only 69 calories. That sounds like a Christmas tradition in the making to me! In a medium bowl, whisk together the whole wheat pastry flour, ground flax seed, ground ginger and salt. In the bowl of a stand mixer (or a large bowl with a hand mixer), combine the agave, egg whites, egg and vanilla extract. Beat until combined. 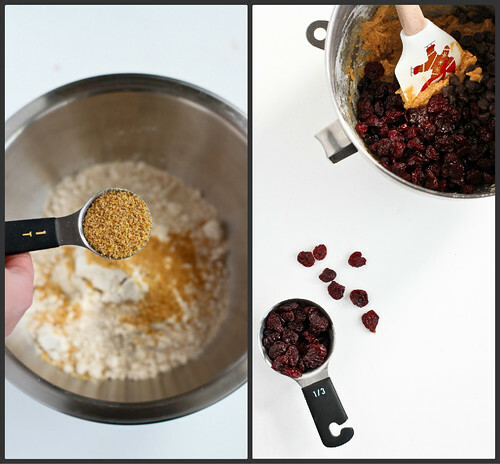 With the mixer on low, gradually add the flour mixture until just combined. Stir in the chocolate chips and dried cherries. With flour on your hands, divide the dough into three even pieces, and form each one into a 6-inch log. Transfer the logs of cookie dough to the prepared baking sheet and continue to form until the logs are 6 inches long, 2 1/2 inches in width and about 1 inch high. Bake until the logs are firm, 25 to 27 minutes. The logs will puff up. Transfer the logs to a wire rack. Cool for 15 minutes. Lower the oven heat to 325 degrees F.
Cut each log on the diagonal into 1/2-inch pieces. Be sure that the pieces are not too thick; otherwise, they won’t bake properly. Lay the biscotti, one of the cut sides down, on the baking sheet (you made need to do this in two batches). Bake for 8 minutes. Flip the biscotti and bake for 7 to 8 minutes, or until the biscotti are starting to brown. Transfer to a wire rack and let cool. The centers will harden as the cookies cool. 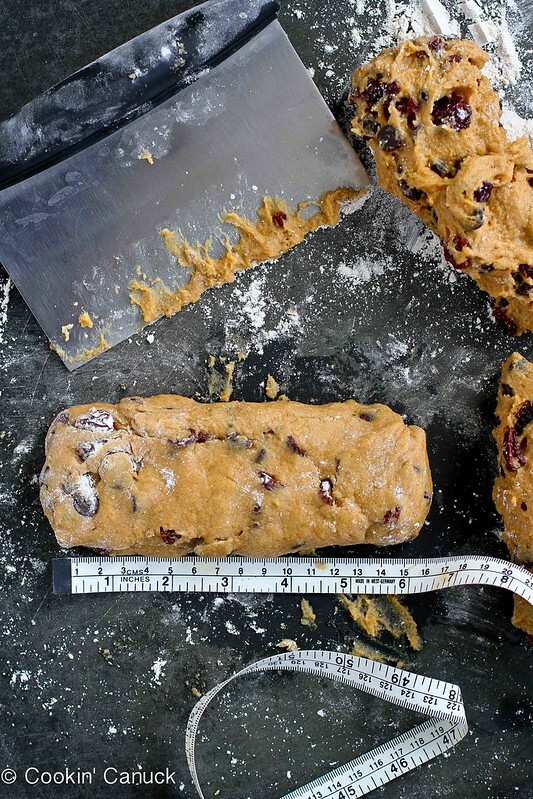 Transfer the logs of cookie dough to the prepared baking sheet and continue to form until the logs are 6 inches long, 2½ inches in width and about 1 inch high. Cut each log on the diagonal into ½-inch pieces. Be sure that the pieces are not too thick; otherwise, they won't bake properly. I just tried to make my first biscotti and I was amazed at how easy they were! I love this chocolate and cherry combo…the perfect way to complement my morning cup ‘o joe. Plus, who doesn’t love to start the day with a cookie? Yum! 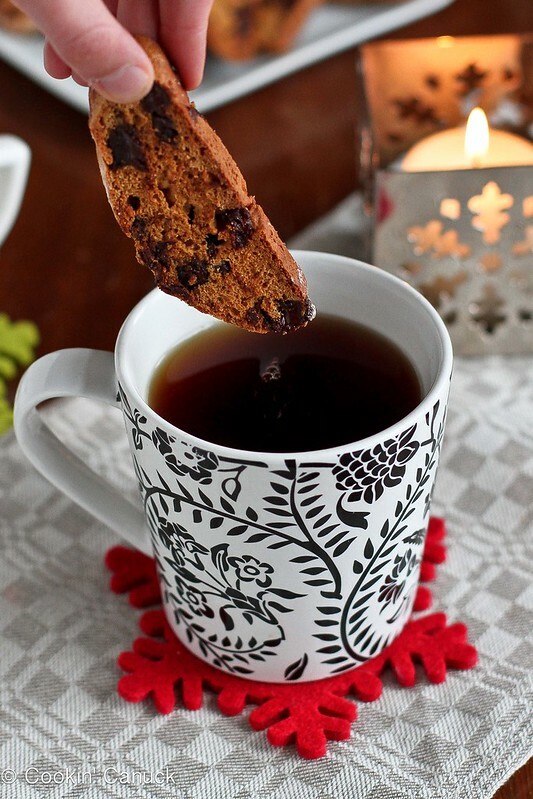 Love biscotti! Yours sound delicious! Love that they have a whole wheat base! 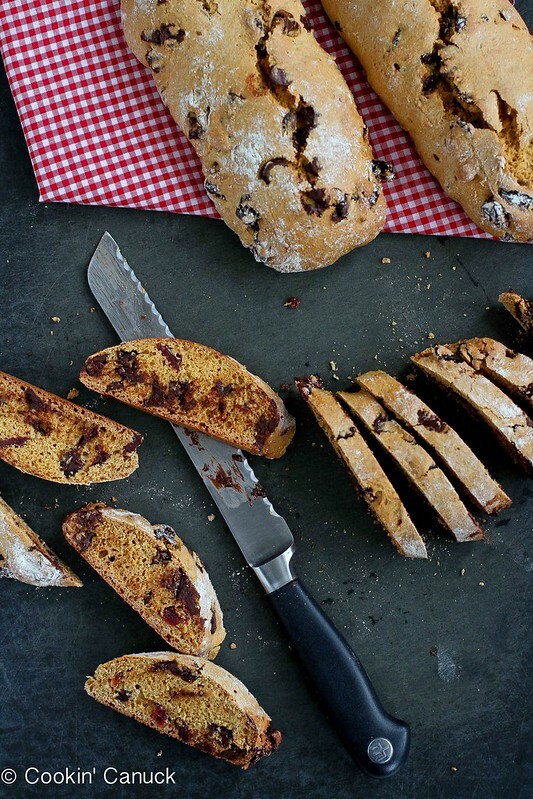 I love biscotti and this whole wheat version with dark chocolate and cherries sounds fabulous! Thank you, Dara. Love your family picture. Love that these are whole wheat! Dark chocolate and cherries is perfect for this time of year! These look delicious! Would you recommend bringing these to holiday parties? Tess, these are best when dunked into a cup of coffee or a latte. They would make the perfect hostess gift! 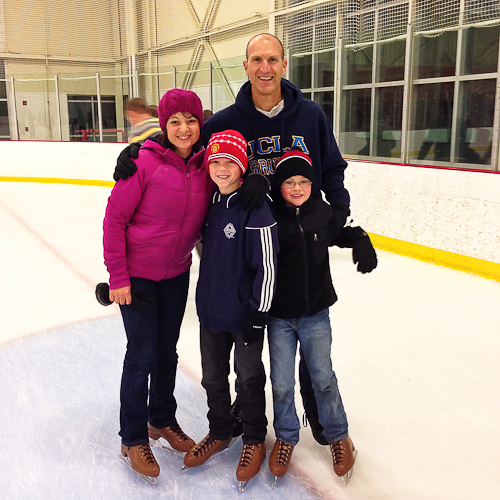 These are gorgeous Dara and I love your fun family pic! Dark chocolate and dried cherries are such a classic combination and I love that you used whole wheat pastry flour – I’ve found it works wonders in baking whole grain favorites. I love biscotti, dark chocolate & cherries are a great addition! Great family pic! I love cherries with chocolate. 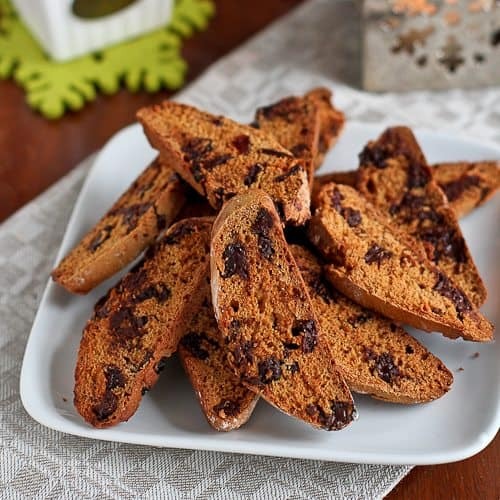 Yummy biscotti. Your family pictures are the best!!! Love it. And what a beautiful recipe! Great recipe! AND great Pictures! just used a little less then the recipe asked for. Question: I noticed this recipe didn’t ask for B.soda or B. powder …. Why?